The need for tough, easily producible, tissue adhesives for medical applications is significant, and much recent research has focused on this expanding field. Surgical and wound care complications remain a major cause of post-operative mortality. Materials used for these applications need to withstand various mechanical deformations and movements while remaining strongly attached to the intended tissue. A simple route to tissue adhesives has recently been described involving silica nanoparticles acting as physical adhesive layer between tissues. New research from the Hermann group at the Swiss Federal Laboratories for Materials Science and Technology has expanded upon this concept with a new article published in Nanoscale. The researchers produce a library of inorganic oxide nanoparticles using a scalable and sterile flame spray pyrolysis method. The particles are then used study how different combinations of nanoparticles affect performance as tissue adhesives and also the toxicity of the resulting tissue adhesive materials. An optimal composition of a mixture of bioglass and silica nanoparticles were found to have exceptionally strong procoagulant and adhesive properties whilst also maintaining superior cyto-compatibility. This highly modular synthetic method paves the way for use of metal oxide nanoparticles as bioactive adhesives in a range of exciting surgical and regenerative medicine applications. A new photo-induced polymer crosslinking strategy has been used to produce optoelectronic devices with improved performance by a group of Chinese researchers. This has allowed quantum dot LED devices to be fabricated on flexible plastic substrates as the scientists can avoid high temperature thermal annealing. Developed at Soochow University and Shanghai Jiaotong University, the researchers believe this crosslinking strategy provides an excellent general method for improving film quality in solution-processed multi-layer LEDs and optoelectronic devices. The improved efficiency of the devices has been ascribed to superior film surface morphology of the device layers, as the range of non-orthogonal solvents able to be used for solution processing is greatly broadened due to layer crosslinking. The device is based on a hole transport layer of conjugated polymer poly[(9,9-dioctylfluorenyl-2,7-diyl)-alt-(4,4’-(N-(4-butylphenyl)))] (TFB), which is crosslinked with a bifunctional benzophenone, with the crosslinked hole transport layer device giving a 2 times higher efficiency than the device without layer crosslinking. Fig. 1. New photochemical crosslinking method enables fabrication of novel all-solution-processed multilayer optoelectronic devices to improve device performance using both orthogonal and non-orthogonal solvents. Cancer remains the leading cause of death worldwide. Therefore, the importance of early screening of cancer can aid in the prevention and treatment. However, early onset of cancers can often produce limited or no symptoms. In this regard, researchers have turned their attention to miRNA biomarkers found in serum as potential biomarkers for cancer detection. At the onset of cancer, miRNA biomarkers often present at very low concentrations representing a big challenge for researchers to develop analytical tools that can achieve the sensitivity required. Researchers from Nanjing, China and Georgia, USA have investigated surface enhanced Raman scattering (SERS) as a viable technique for the detection of 3 miRNA biomarkers related to lung cancer. To achieve this, the researchers used a silver nanorod (AgNR) array to provide the plasmonic enhancement required for SERS. The substrate was subsequently functionalised with molecular beacons (MBs) containing different Raman reporters (ROX, Cy5 and FAM) that are complementary to the miRNA targets. In the absence of miRNA target, the SERS signal remains high since the MBs, and, therefore, the Raman reporters, are orientated close to the AgNR substrate. However, when the MBs hybridise to the target sequence, the SERS signal drops in a concentration-related manner allowing quantitation of the target miRNAs in buffer and human serum. The limits of detection for the 3 biomarkers, miRNA-21/486/375, were 393, 176 and 144 aM, respectively. This research highlights the advantages of using SERS for biomarker detection. The low sensitivity and ability to multiplex make SERS a promising analytical technique for future clinical analyses for cancer detection and other diseases. Scheme 1 Schematic illustration of the preparation and application of the molecular beacon functionalized-SERS sensor for simultaneously measuring multiple miRNAs. The development of analytical devices that convert biological response into an electrical signal is a very important goal with great potential benefits for clinical diagnostics, environmental science, and defense. In a recent communication published in Nanoscale, researchers discuss findings from a newly developed single silicon nanowire (SiNW) based biosensor, which is able to directly detect protein adsorption/desorption at single-molecule resolutions. Fig. 1 Schematic demonstration of SiNW FET-based electrical biosensors, where Au electrodes are passivated by using a thermally deposited 50 nm-thick SiO2 layer. The inset shows how His-tag F1-ATPase is immobilized on the surface of SiNWs through Ni2+ chelation. SiNW’s were synthesised following an Au-catalysed vapor deposition method and then high-density SiNW array devices were fabricated on silicon substrates using photolithography. Subsequently the devices were functionalized in a stepwise manner to impart the biomolecule recognizing Nickel functionality, and characterized with XPS and FTIR spectroscopy. 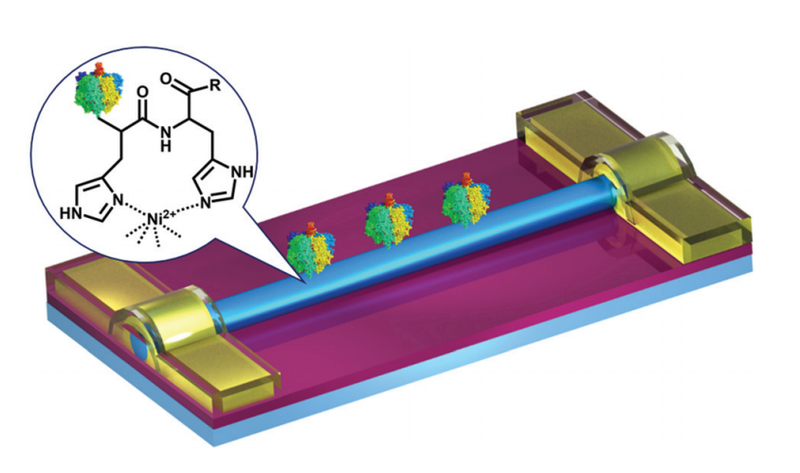 By combining theses devices with microfluidic systems, the authors were able to achieve real-time, direct detection of the chelation between Nickel and the imidazole of His-tags in the target biomolecules (F1 ATPases) at the single-event level. This nondestructive and label-free sensor shows great promise for number verification and real-time monitoring of proteins in complex biological systems. In recent years, super-resolution microscopy has enabled researchers to explore biological interfaces at the nanoscale. 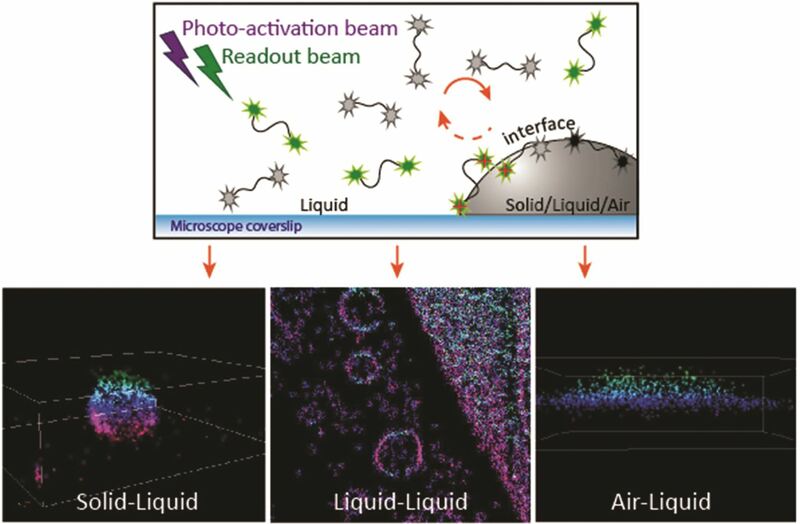 Single-molecule localization methods, such as point accumulation for imaging in nanoscale topography (PAINT), are fundamental techniques for studying the morphology and architecture of living matter. While super-resolution microscopy techniques like PAINT have acquired the interest of researchers in biology, it remains elusive to applications in soft matter and materials science. In issue 16 of Nanoscale, researchers from the Netherlands have endeavoured to overcome the limitations of PAINT, such as a pre-requisite for hydrophobic domains or specific ligand/receptor pairs, by introducing interface point accumulation for imaging in nanoscale topography (iPAINT). In short, this new technique enables nanometre resolution imaging of interfaces by non-covalent, continuous labelling during imaging. This was achieved by labelling silica nanoparticles with polyethylene glycol (PEG) end-functionalized with a photoactivatable rhodamine analogue (PEG552) that is able to continuously adsorb and desorb from the interface. This method of labelling is essential for interfaces such as emulsions, foams and crystals like ice. By employing iPAINT as a generic imaging method, the authors are able to obtain super-solution images at different interfaces in 3D. This innovation allows users to develop PAINT in other fields, such as colloid and interface science, food science, soft matter physics and nanotechnology. Lateral flow assays (LFA) have become a promising tool in the diagnostics market in recent years due to their low cost, ease of use and short assay times. The simplicity of their use extends to the inclusion of, typically, gold nanoparticle labels that provide a visual confirmation, due to their distinctive red colour, of a particular target analyte. However, limitations, such as quantitative analysis and assay sensitivity, can hinder their broader use in diagnostics. 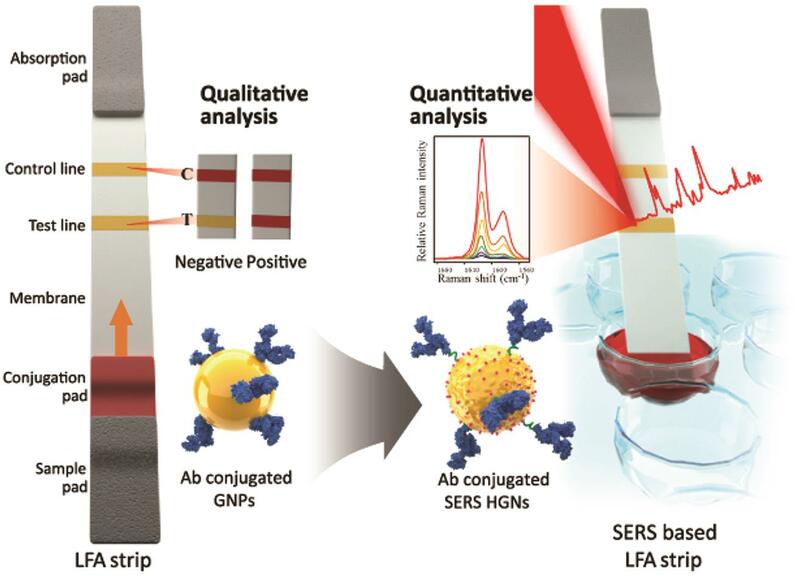 To overcome these limitations, researchers from South Korea have utilised surface enhanced Raman scattering (SERS) to detect staphylococcal enterotoxin B (SEB) on a LFA strip. The authors have opted to use Raman reporter-labelled hollow gold nanospheres (HGNs) instead of the conventional gold nanoparticle labels. Using HGNs, the authors were able to detect as low as 0.001 ng/mL of SEB, which is about three orders of magnitude more sensitive than the conventional ELISA-based method for SEB. These researchers demonstrates that SERS can be utilised to overcome the limitations of conventional LFAs in order to achieve greater assay sensitivity without deviating from the original LFA design. In this HOT article, tumour-specific targeting using superparamagnetic iron oxide nanoparticles (SPIONs) combined with ionising radiation is investigated. Heat shock protein Hsp70 is known to be expressed by cells exposed to stressful conditions or specifically on the membrane of highly aggressive tumour cells. SPIONs, which are negative contrast agents for magnetic resonance imaging (MRI), were synthesised to contain the Hsp70 specific antibody (cmHsp70.1) to increase uptake into various tumour cells. Conjugation of the cmHsp70.1 was accomplished by introducing amine groups to the dextran polymer coating of SPIONs, allowing covalent attachment to the carboxylic acid functional groups of the antibody through carbodiimide coupling. This was shown to dramatically increase loading of iron oxide into various tumour cells, compared to unconjugated SPIONs. By exposing cells to a non-lethal dose of ionising radiation, additional uptake could be achieved as cells express more of the heat shock mHsp70. The differences in uptake can be seen in the figure below in both in vivo and in vitro environments using MRI and fluorescence microscopy, respectively. This approach has the potential to be clinically relevant for both diagnosis and therapy of tumours. Figure 1 Targeting of the orthotopic C6 glioma by SPION–cmHsp70.1 conjugates. (A) Magnetic resonance images for the control, non-irradiated animals treated with SPIONs, SPION–cmHsp70.1 particles and irradiated rats (10 Gy) treated with SPION–cmHsp70.1. 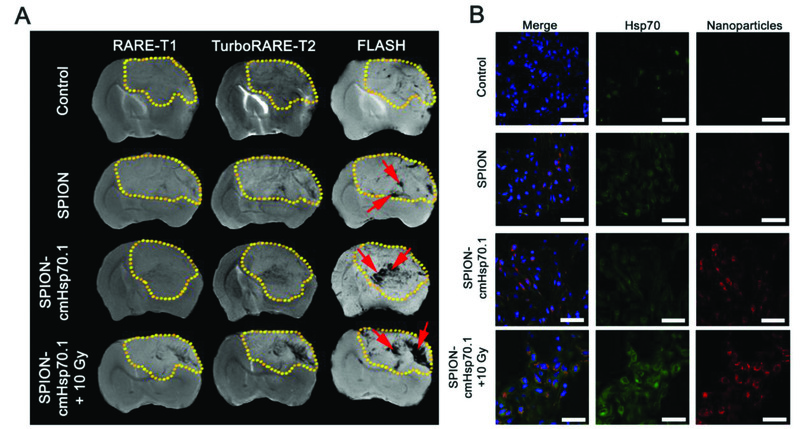 Images were obtained in RARE-T1, TurboRARE-T2 and FLASH regimens. Retention of the nanoparticles in the tumor presented as hypotensive zones on T2-weighted and gradient echo images (red arrows). (B) Immunofluorescent images of the brain tumor stained with anti-Hsp70 antibodies (green). Nuclei stained with DAPI (blue). Nanoparticles detected using reflective laser scanning at 488 nm (red). Scale bar, 40 μm. In this article, Scheutjens-Fleer self-consistent field (SF-SCF) theory simulations were used to accurately predict the position of a nanoparticle attached to the end-group of a responsive polymer chain surrounded by a majority of non-responsive polymer chains in a mixed brush system. Certain stimuli such as pH or temperature can be used to create a defined ‘on-off’ switch between a protected ‘off’ state, where the responsive polymer chain is contracted thus burying the nanoparticles well within the non-responsive components, or an ‘on’ state where the nanoparticle is exposed to the medium through swelling of the responsive polymer chains. The solvent quality was parameterised by the Flory-Huggins interaction parameter (χ) and for nearly all investigated systems there was a sharp transition at the so-called critical χ value between the on-off state. Design variables for mixed polymer brushes such as grafting density, chain length and nanoparticle size were investigated and all had an effect on the critical χ value, with a larger particle size and grafting density leading to an increase in χ. Fixing the polymer chain length for both responsive and non-responsive polymer chains led to the most optimal switching. The authors are planning to develop materials from these findings and use the mixed polymer brush-nanoparticle systems as rapidly responsive (bio)sensors with single molecule sensitivity. 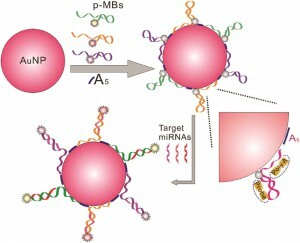 Researchers from Chinese Academy of Sciences have investigated the use of molecular beacons (MBs) for the simultaneous detection of multiple microRNA (miRNA) biomarkers. The MBs were immobilized onto gold nanoparticles (AuNPs) via poly-adenine (poly-A) spacer. In addition, the authors used short oligonucleotides (oligos) consisting of 5 As in order to fill the gaps between MBs on the AuNP surface to ensure stability in salt solutions and obtain greater fluorescence signals. MBs with 3 different fluorophores were employed in order to enable multiplexed detection of miRNAs in simulated serum samples. The authors reported that each MB specifically bound to its corresponding miRNA target in the presence of 10% fetal bovine serum (FBS), thereby demonstrating the applicability of this method for real biological sample detection. In recent years, miRNA has emerged as a potential biomarker for many types of diseases, such as cancer, neurological disorders and cardiovascular disease. The need for rapid and sensitive assays for miRNA detection is therefore of great interest. Wang et al. have demonstrated a step in this direction with the research presented here. You are currently browsing the archives for the Web writers category.